Demand for MDSI Solutions Increased in 2003! 2003 was a tough year for many businesses, especially difficult for companies in manufacturing and in the machine tool market. In 2003 for North America, AMT reports machine tool consumption dropped by 7.9%. During these difficult times suppliers and manufacturers have become lean, highly-productive and creative. MDSI is no different. 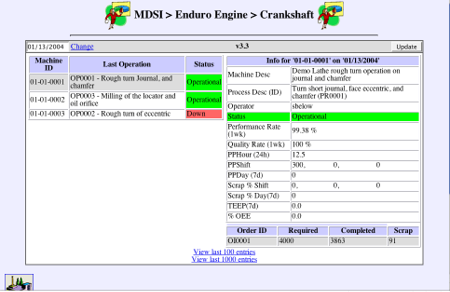 MDSI has spent most of 2003 focusing on how we can help our customers become more efficient and reduce cost. As a result, MDSI had stellar performance with 2 record quarters for sales in 2003. MDSI expects the trend to continue for 2004, and will have its highest sales since being established! Early in 2003, MDSI determined our customers wanted a complete, easy-to-install and configure, control solution. No longer did buyers want to go to seven different vendors to put together a CNC control. For years MDSI has tested, certified and standardized on hardware platforms. With this in mind and already holding the hardware expertise, it was time for MDSI to provide a complete package. 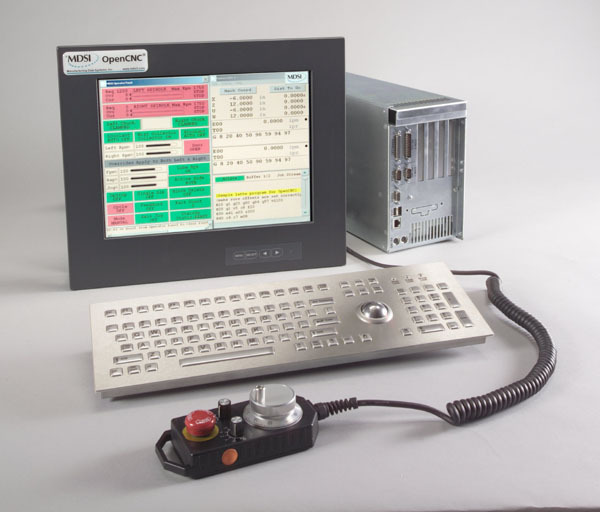 The first hardware package consists of an industrial PC, touchscreen monitor, keyboard, and a passive motion control card, loaded and tested with OpenCNC® or WinMotion®. MDSI is entering 2004, having developed another product and is currently testing this new control system at several customer sites. This new product will have a great impact on the controls market in North America and worldwide. It is the next step in the evolution of controls; this solution will be officially announced the end of March 2004. Make sure to pick up the February issue of Tooling and Production or visit www.toolingandproduction.com and look for the editorial (GRINDERS GET OPEN ARCHITECTURE CNC) on MDSIs OpenCNC Grinder product. As part of providing our customers the best, robust, easy-to-use solutions, MDSI annouced this new product in Janurary 2004. OpenCNC Grinder was built on MDSIs production-proven high-performance CNC technology. OpenCNC Grinder maintains the flexibility and power of open architecture, while providing the ease of use and built-in features of a standard control package. The OpenCNC Grinder package provides the ability for the operator to program up to 20 grinding sequences and the flexibility for adding custom sequences. The OpenCNC Grinder package includes MDSIs packaged control solution, user interface, engineering drawings, logic examples, and I/O. The OpenCNC Grinder package supports SERCOS, Mechatrolink, Profibus, DeviceNet, Ethernet and Opto-22. MDSI also offers an optional drive package and handwheel. OpenCNC Grinder maintains the flexibility and power of open architecture, while providing the ease of use and built-in features of a standard control package.. Many of you have already heard rumors about MDSIs latest innovation and may have seen information on our website. MAXIMUM Factory, is a Factory Information System (FIS), Manufacturing Execution System (MES), and Collaborative Manufacturing System (CMS). In other words, "it does it all." MAXIMUM Factory originated from a software suite developed by Tecumsehs Open Controls Team. The original concept of this product was to give manufacturers complete control of their factory floor and to give the operators and maintenance teams the tools necessary to become more efficient and aid in process improvement. After 3 years of development, testing and research, the first public release of the product will include the following modules: Production and Documents.. MAXIMUM Factory is currently being beta tested at several manufacturing locations. MAXIMUM Factory v1.0 is scheduled to be released April 2004. Contact your sales representative for more information and delivery schedules. For the first time ever, in October 2003 MDSI displayed its array of solutions at the EMO show in Milan, Italy. The attendance was overwhelming and the enthusiasm for a manufacturing recovery and MDSI products was at an all-time high. MDSI displayed previews of its new OpenCNC Grinder package and MAXIMUM Factory products. MDSI currently has one office in Cologne, Germany. Business in Europe has steadily increased since our presence at the show in Milan. In 2004, we are expecting to make great strides into the OEM market and for our business to increase steadily. Contact Kelly Van Blaircum, Sales Manager, sales@mdsi2.com, for information on MDSI solutions in Europe. With the advent of offering complete solutions, MDSI has raised the interest of several OEMs (machine tool builders). In 2003, MDSI has signed up more high-volume OEMs, completed a large OEM project in Brazil, and is working on several other OEM projects scheduled for release during the last two quarters of 2004. Be on the look out for new machines delivered with MDSI solutions, and if you are purchasing a new machine where MDSI solutions arent available, be sure to specify the only true open architecture control! Thank you for reading MDSIs first edition of Significant Events. Significant Events will contain all the latest information on MDSI products, solutions and events. Significant Events will be released quarterly and delivered to you automatically. If you are not signed up to receive Significant Events, you can sign up on our website at www.mdsi2.com or call 734-769-9000 x216 and ask for Chuck. See you next quarter! ©1997-2007, Manufacturing Data Systems, Inc. All Rights Reserved. MDSI, the MDSI logo, OpenCNC®, and WinMotion® are registered trademarks of Manufacturing Data Systems, Inc. Significant Events; and MDSI Motion are trademarks of Manufacturing Data Systems, Inc. Microsoft, Windows, Windows NT, Visual Basic, and Visual C++ are either registered trademarks or trademarks of Microsoft Corporation in the U.S. and/or other countries. All other brand or product names are trademarks or registered trademarks of their respective owners. Manufacturing Data Systems, Inc. (MDSI) is a division of Hurco Companies, Inc..